This is probably the third or fourth biography of Churchill that I have listened to or read, and while I would agree that Manchester's three volume biography is probably the best I have read (I enjoyed the first two volumes but not the third volume), this is the best one volume biography. While Roberts does an admirable job in chronologically dissecting Churchill's life, what stood out for the me was that this biography was both fair and balanced. Not only does Roberts introduce us to Churchill as the courageous great hero that he was, but he also readily points out Churchill's mistakes and human frailties (e.g. denial of Indian Home Rule in the 1930's, his decision as Chancellor of the Exchequer to return Britain to the gold standard in the 1920's) and how they helped him to become the man who would stare down Hitler during the war. I believe that Roberts' book also offers us further insights into Churchill that were not available to previous authors- namely Churchill's relationship with King George VI during the war years (Roberts had access to the King's diary during the period of Churchill's premiership) which shows the reader more of the human fear that Churchill had during the war, and the diaries of Ivan Maisky, the Soviet Ambassador to London during the 1930's and 40's, which gives us greater insight into Churchill's years in the wilderness. 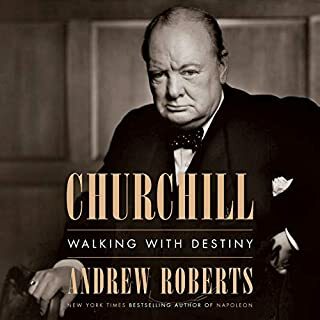 In summary the book is the best one volume biography of the man and I believe that it is a great contribution to the study of Churchill. Stephen Thorne's narration was also very good. I read this book (paperback) when it was first published in the late 1980's. At the time, I was amazed about how much I learned about the modern Middle East and how World War One, the fall of the Ottoman Empire and the colonial desires of Great Britain influenced the predicament that this region confronts today. Listening to the audio book reinforced my learning experience and I would recommend that others who wish to learn more about the rifts and turmoil that exist in that region today. At the outbreak of the first World War, the entire Middle East (with the exception of Egypt) was controlled by the Ottoman Sultan in Constantinople (now Istanbul). Although the Sultanate was corrupt, the European powers (in particular Great Britain and to a lesser degree France) propped up the "sick man in Europe" for the sole purpose of constraining the influence of Tsarist Russia in that area. Both Britain and France felt that if the empire fell, the Russian navy would gain control of the Dardanelles and eventually have an outlet into the Mediterranean Sea- where it could challenge both powers. This all changed in 1894 (when France struck an alliance with Russia) and 1907 (when the British entered into a treaty with the Russians to end the "Great Game" in Afghanistan and Persia (Iran)). Both Great Britain and France abandoned Turkey and drove the Sultanate into the camp of the Central Powers led by Germany. When war broke out the British did everything in their power to bring down the Sultanate and carve up the empire with France and Russian (Sykes Picot Sazanov Treaty). The books delves into this alliance and also how the Arab Revolt (T.E. Lawrence of Arabia fame) and the Balfour Declaration (in favor of creating a Jewish state under British protection) played into the hands of British Prime Minister David Lloyd George, who tried to use every means at his disposal to annex key portions of the Middle East to the British Empire. Unfortunately for the region the British were unable to fully carry out their plans but what did they did carry out brought turmoil to the region until the British eventually pulled out of the region following World War II. Professor Fromkin does an excellent job weaving historical information into the personalities who participated in the spectacle (most interesting were Lord Kitchener, Sir Mark Sykes, Winston Churchill Georges Picot on one side and Enver Pasha, Djemal Pasha and Mustafa Kemal on the other side). 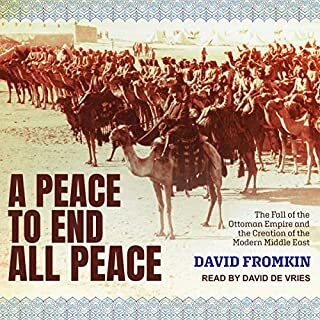 In my opinion while others have gone on to more fully explain the history (see Eugene Rogan's book on the Fall of the Ottoman Empire, History of the Arabas and Jonathan Schneer on the Balfour Declaration-all available from Audible), this book still remains the seminal book on the subject. While I thought his narration was decent and well spoken, I do not believe that David de Vries was the best narrator for this book and he had many mispronunciations. I believe that Derek Perkins would have been better. Nevertheless I still highly recommend this book to listeners who wish to learn more about the making of the Modern Middle East. This is the first book by Lynne Olson that I have had the opportunity to read/listen to. I was very pleased when Audible finally made this book is available. The book is an extremely good book of narrative history that would have made Barbara Tuchman proud (she being the author of the Guns of August which is arguably the greatest narrative history book ever written). 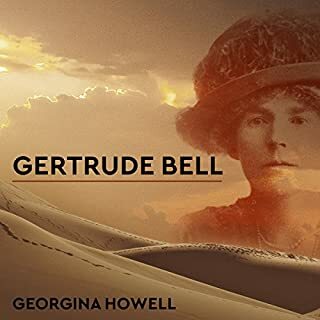 The story focuses on the group of Tory Members of Parliament who had the courage and strength to bring down the Neville Chamberlain government in May 1940. Historically, WInston Churchill has been the MP who has received the lion's share of the credit for turning the British government from an appeaser movement that gave away Europe to Adolph Hitler to a war footing government that confronted him head on. During the book we are introduced to the MP's who truly paved the way for Churchill and Olson does a fabulous job of painting their character portraits- from Anthony Eden (who has the opportunity to lead the revolt and become Prime Minister but who lacked the courage to take on Chamberlain) to Richard Law, Robert Boothby, Harold McMillan, Harold Nicholson, Duff Cooper Leo Amery (who had the great speech quoting Oliver Cromwell that brought the government down) to Lord Salisbury, and tragically the Duchess of Atholl who as a female Tory member of Parliament and who after reading Mein Kempf bravely confronted the Tory Hierarchy and lost her seat in Parliament. Perhaps the most tragic but courageous figure in the book is Ronald Cartland, who as junior Tory MP had the courage to stand up and condemn Chamberlain (breaking with tradition for a Member of Parliament) and then volunteered to fight in France only to be killed while leading his men in a rearguard action while the British Army retreated to Dunkirk. 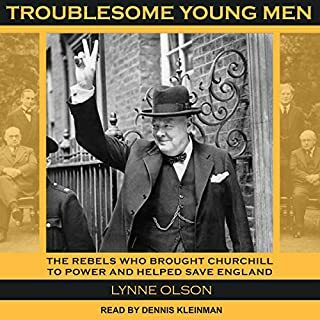 Olson does an excellent job of providing us with a detailed portrait of each of these personages and by the time I finished reading the book I appreciated how much Churchill owed to these heroes. The narration by Dennis Kleinman was very good and the wait to hear this book was well worth it. I highly recommend this book to anyone who wishes to understand more about the rise of Churchill and the movement to move Britain closer to war. As a practicing lawyer and student of history, I found this book to be outstanding. To a law school student, John Marshall is an icon in American legal history as it was he who defined the role that the US Supreme Court plays in the American political system. As a law school student, I read and studied many of his opinions (Marbury v. Madison, Gibbon v. Ogden, Woodward v. Dartmouth College as examples) which are seminal cases in US law, I never did have an appreciation for the political waters in which Marshall navigated the court nor did I know much about his personal life. 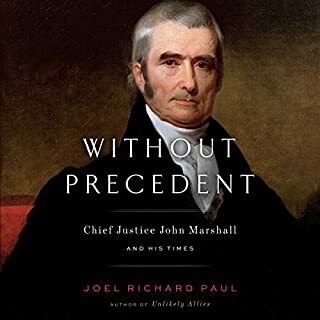 This book added great color to my picture of him and I came away with a greater appreciation of what Marshall accomplished not just during his tenure as Chief Justice of the US Supreme Court but also as a statesman (he was a diplomat and also the only Justice who also served briefly as Secretary of State during the John Adams administration) and hard scrabble frontiersman who, born of humble origin was able to invent himself as a soldier and lawyer. The book was well written and the narration by Fred Sanders was very very good. At times I thought the book offered too much hero worship of Marshall but the author balanced this much later in the book when he discussed Marshall's turnabout in the Antelope and Cherokee Nation cases. The book also was very disparaging of Thomas Jefferson, James Madison and Andrew Jackson (which in my opinion is somewhat justified as I personally believe that Jefferson was a very duplicitous hypocritical person), but I thought that the final chapter of the book in which the author contrasted the careers, political philosophy and characters of Jefferson and Marshall (Jefferson and Marshall were distantly related) was a perfect conclusion to the book. I strongly recommend the book not just to law school graduates, political scientists and history students, but also to all readers. In many ways, what Marshall confronted in his times is not much different from what we are confronting as a nation today. This was a truly great book. It was well written and well narrated. In listening to to the book it struck me as a cross between a book about totalitarianism (1984) and a novel. It's hard to believe that it is a true story. I am avid student of history who has particular interest in WWI and the Russian Revolution. I have never been a big fan of Sean McMeekin (I have read a few of his books in print and also listened to July 1914- available through Audible). That being said, this book was really interesting and kept my attention. The books begins with a history of Russia in the 19th Century and what life was like in the various parts of the Tsarist empire and then follows through the tumultuous years of the Revolution of 1905, World War I and the fall of the monarchy followed by a discussion of how the Bolsheviks under Lenin and Trotsky seized power and eventually won the Civil War. At the beginning of the book, McMeekin takes the listener through a tour of the various parts of the empire by casting the listener into the role of a foreign visitor coming to Russia for the first time. This was a very unique manner for describing what Russian life was like under the Tsars and added greatly to the book. 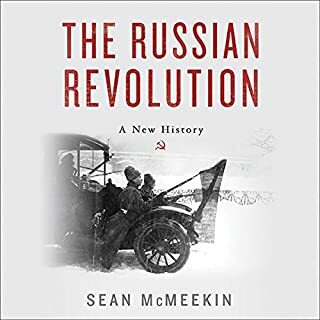 The discussions of the fall of Nicholas II and the Provision Government under Kerensky are also very well depicted and McMeekin sheds light on an alternative theory as to the events that led to the February Revolution. He also does a great job describing how following the July days of 1917 Alexander Kerensky had an opportunity to fortify his rule of Russia only to be driven paranoid the the fear of a right wing putsch. This paranoia led to his turning to the Bolshevik Part for support which eventually led to downfall in October 1917. The biggest issue with the book is that there are so many different actors who played a part in the 1917 revolutions that it can sometimes be overwhelming to a listener who has no background of in this aspect of Russian history. Nevertheless I found this to be a great book and I am glad I listened to it. The narration by Pete Larkin was decent but not great and I believe it would have been better if Derek Perkins had been the narrator. I just finished listening to this book after having listened to the RA White biography of Ulysses Grant (American Ulysses- available from Audible). 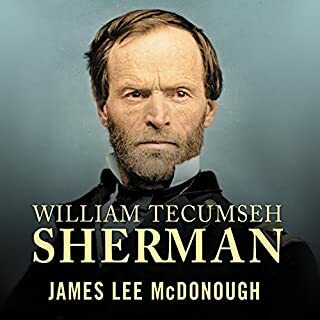 I found this biography to be superior to that of the Grant biography simply because McDonough took the time to objectively present Sherman not just as a hero but also as a human being who had many of the flaws that seem to haunt great men and are often overlooked in their biographies. In Sherman's case, these flaws included his prejudice against African Americans, his hatred of the press and politicians, his nervous disposition and his aversion to being a commanding general (which resulted in his disgrace following a brief command of the Army of Ohio early in the War) and his anti-Catholicism. The author did a great job of sketching these flaws and also presenting the opinions of other scholars in evaluating Sherman as both the man and the general. By the time I finished listening to the book, I actually felt that I knew Sherman as a man and not just as a Civil War hero. David Drummond's narration of the book was very good. I am not fan of fiction, but I must admit that I thoroughly enjoyed this novel. It was well written and beautifully narrated. 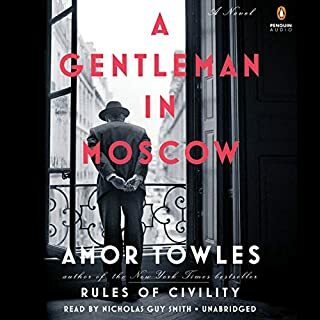 The book traces a fictional Russian Aristocrat, Count Alexander Ilych Rostov who fled Russia before the outbreak of World War I and returned to Russia following the execution of the last Czar- only to be arrested four years later (1922) by the Bolsheviks and sentenced to lifetime house arrest in the Metropole Hotel in Moscow (near the Kremlin). The novel chronicles his 22 years of imprisonment in that hotel and through his eyes the listener enjoys a front row seat in watching Russian history unfold during the Stalinist period (including the Collectivization Farm Project, the Purges, a little bit of World War II and the beginning of the post-Stalinist period). While the count remains locked in the Metropole (and the world he has created for himself therein) the listener is given the opportunity to see how his world stays the same while all of Russia changes and the changes are exemplified through the people with whom the count comes into contact with- including his longtime friend from university, Mischa (a poet), a Soviet era actress (with whom he has a love affair), a little girl whose father was a Ukrainian bureaucrat, and then several years her daughter. The book was extremely well written and narrated that I finished listening to it in less than 3 days (which I normally never do). Some of the quotes from the count in reaction to the change in his circumstances are really profound and worth remembering. Admittedly there are some historical inaccuracies in the book but these in no way infringed on my enjoyment of the book. I very much enjoyed this book. I thought that the book was well narrated and I bought the Kindle book. I found myself switching between the two mediums: audible and kindle and found the experience to work well here. The book is essentially lays out stoicism philosophy as espoused by Seneca and Marcus Aurelius, among others. The philosophy and the book are broken down into the three key blocks of stoicism: perception, action and will. The author does a great job of discussing each of the three blocks and then discussing how historical figures were able to exemplify each of the attributes. 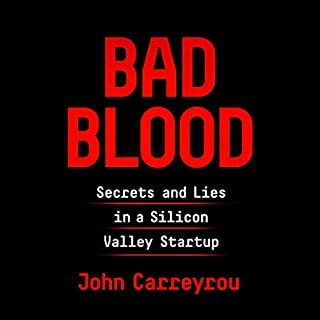 The audio book has an extra chapter in which Tim Ferris interviews Ryan Holiday (I guess as part of the Tim Ferris Podcast Show). 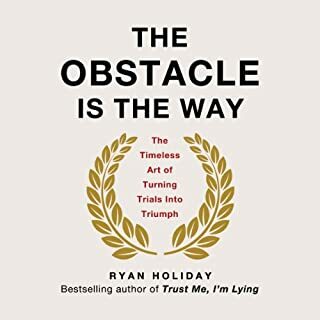 I am not certain if the interview really adds much to the audio book except to make Ryan Holiday come over as a human being. I would strongly recommend purchasing the audio book and consider purchasing the Kindle book (if you have a Kindle) as a reference guide. I must admit that I have already listened to the audio book twice and read the Kindle edition once. Overall a really good book and worth the listen.